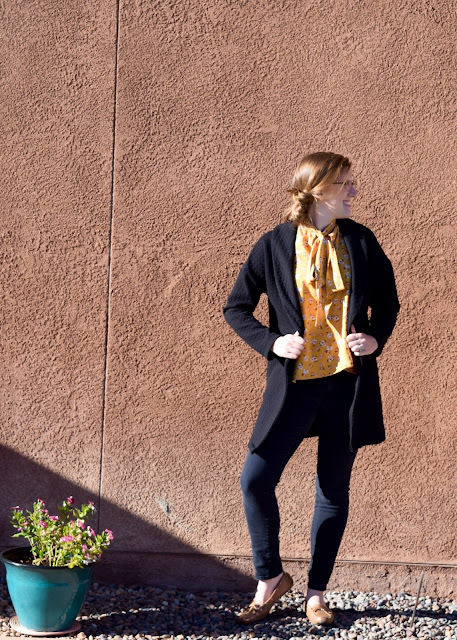 We're more than half way through the Fabricista Fashion Challenge and the competition is fierce! The ladies did a great job this week coming up with day to night looks that work well in their everyday lives. And don't forget to post your day to night look on Facebook or Instagram. Details at the bottom of this post. 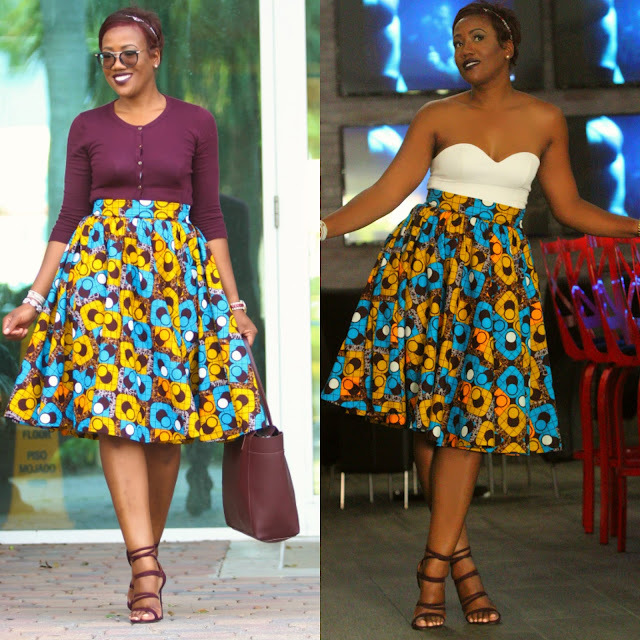 Sew, for this week's challenge we had to do a look that could be transformed from day to night. The rules were that we had to create two of the pieces and then choose one item from out wardrobe to mix and match to create the two looks. I decided that I wanted to make a duster...it's actually a piece I have wanted to add to my closet for some time. 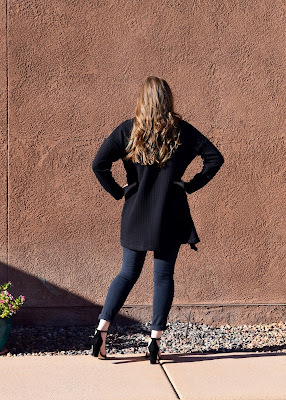 I began to think about my fabric choices and I quickly decided that I would be making one item in black fabric because as you know that is my FAVORITE color to wear! I then remembered this beautiful floral fabric I purchased this past summer in L.A. When I got home I could not decide what to make out of this fabric because I remember thinking hmmm I would love it as a dress, or a top, or a skirt, or even a pair of flared pants. Then it dawned on me I could use it to make my duster that could also be closed and worn as a top or even a dress! My first outfit is something I would wear to run errands during the day and then my night look is something I would wear out on a date! Love how quick I could switch it up! For the duster, I used Simplicity 8059 which is sized for stretched knits and I figured it would work seeing that my fabric had some slight stretch in it. I cut my true size and it came out PERFECT! I am sooo in love with this duster and the fact that I can also wear it as a dress is a huge plus. I did make a few minor changes when sewing the duster. I did not use pattern pieces 9 or 10 so I omitted steps 2-7. 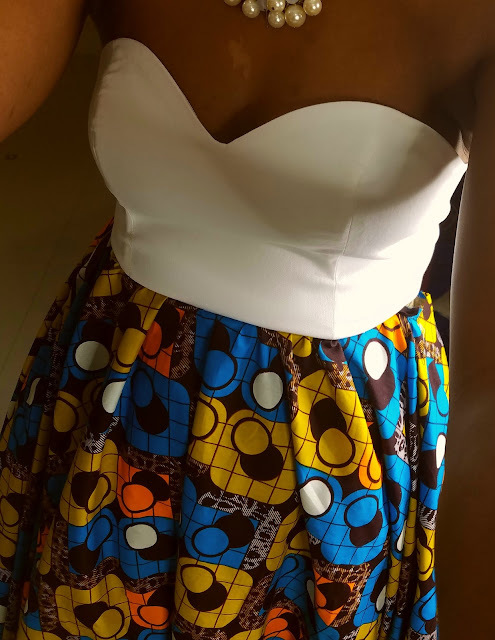 For the pencil skirt, I actually utilized Mimi G's tutorial but I decided that I wanted to add a waistband and insert the elastic instead of connecting the waistband directly to the skirt. For the item from the closet, I chose a basic white boyfriend tee which is a staple for me. I decided to knot it in the front since I made a high-waisted pencil skirt. This outfit was very simple which reflects my personal style. Simple yet classy and stylish! For the dress, I decided to use some of the leftover fabric to create a sash so that I could tie to duster into a faux wrap dress. The day to night look was a bit of a challenge in deciding what I really wanted to create to add to my collection of vibrant colors. I wanted to create 2 pieces that fits my personal style; one garment that I was familiar with creating and another one that I always wanted to create and had fears. The idea of creating and wearing a sweetheart bodice with my love of skirts was ideal for the night look as I could cover with a jacket or cardigan from my closet to wear during the day. I chose to select vibrant colors that can transition from one season to the next. I wanted to show versatility omitting the typically greys and dark tones that we tend to wear in the business arena. I am in love with bodice, bustier and corsets and opted to create a sweetheart bodice with loops to secure the back. I choose to use a pattern that I purchased on Etsy from craftyalex shop that I can reuse and modify for future projects. The pattern is a sweetheart cut line with panels that would work perfect with the off white denim stretch fabric from my stash. 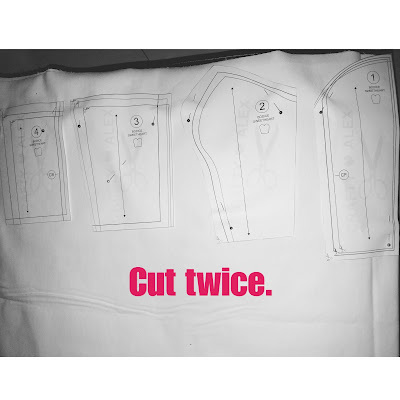 This pattern was so easy to cut as it has 4 pieces, and great visuals with clear easy instructions that I could follow. 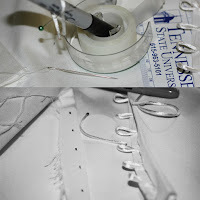 I watched several YouTube videos before on sweetheart bustier and bodice constructions to learn how to create the case for the boning and other techniques such as top stitching to have a clean and smooth finish. I opted to remove the zipper for this project as I plan to wear this bodice over a fitted classic shirt in the future. Even though this was an easy sew, the bust area curve and loops required careful execution for a smooth clean finish. The loops and the details in the back took double the time than it took to sew the bodice. I had prior knowledge working with loops from a previous project but opted to use the perfect white cording from my stash. I carefully used my tape (as a placement test for the loops) and the circumference of my sharpie to ensure that each loop had the exact measurement. I then taped to ensure placement and position and pinned to my dress form before hand stitching all 12 loops. This task was extremely tedious as I measured the markings 1 inch apart and then and used a needle to fully secure before going to the machine to finish the project. I opted to stitch the loop on the inside lining, folding over about ½ inch to close it up and then double stitching to complete the finish. The simplicity cording that I found at Joann Fabrics was absolutely perfect and gave it a beautiful finish. I was in limbo about adding more details or creating straps but the beauty and simplicity of the white on the dress form was spectacular with the bold colors from the skirt. Looking back and having worn the bodice all day before the shoot, I would have added boning to all seams to have a more structured look. The instructions only required boning for the front bust area. I noticed that after a while, the denim started to stretch even more than I anticipated. I am very happy with the technique and finish but the next time I create this project, I would consider straps and adding boning in between each panel. I would also add a single piece of fabric to cover the straps in the back. The Gathered Circle Skirt - Ankara Print (Holland/Dutch wax fabric). I really wanted to use up the last of my ankara print (cotton) fabric that I purchased this past summer in Washington DC. I love sewing skirts with bold prints because of its vibrant color palettes and endless possibilities with tops. 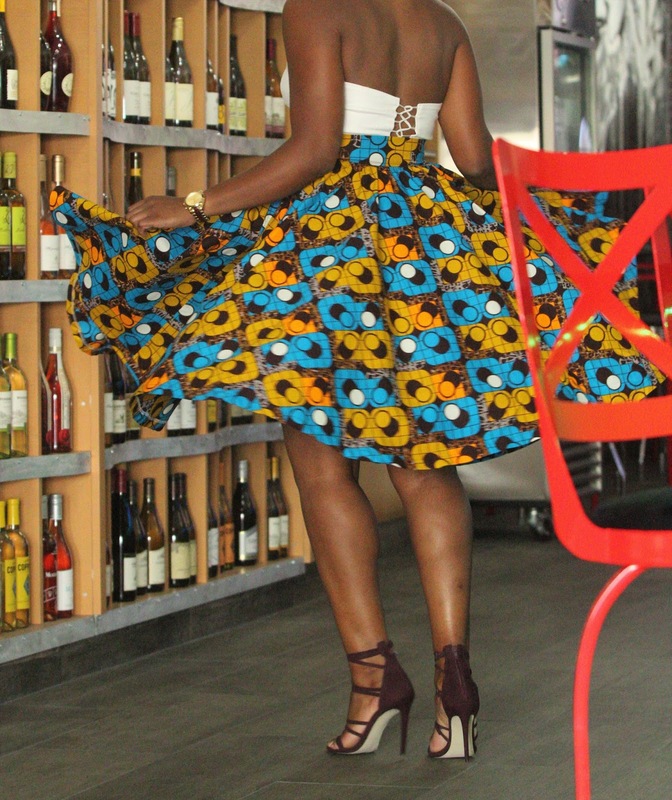 The ankara fabric has a lot of structure and is typically used to create hats, blazers, skirts and dresses. 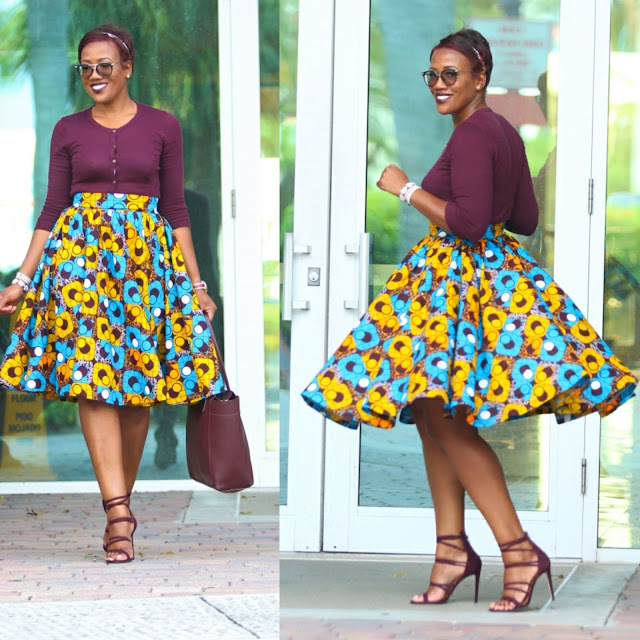 I love the hues as I can wear this skirt both in the fall and spring here in Florida. I wanted a super full circle skirt so I opted to cut a circle skirt that was double the measurement of my waist and gather it. Cutting the circle skirt was a bit of a challenge on my table so I opted to use my floor instead. I carefully used my tape measure crawling around in a circle and marking with a chalk. I then used my curve ruler to connect the markings for the front piece. Once the front was done, the headache of matching the seams of the prints for the back took a bit of concentration. 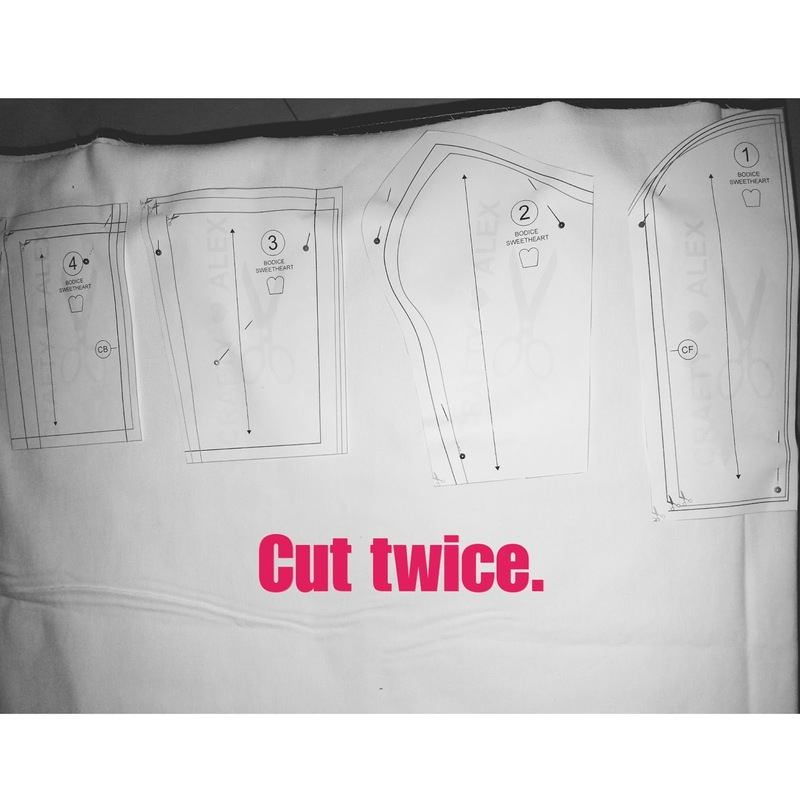 Mind you based on the waist measurement that I used, I had to cut 2 pieces on fold and made my life easier but cutting 1 and placing the other on top as both pieces were identical. I was able to use almost 6 yards and did not even have enough left for a skirt for my daughter. The gathering technique that I choose was using the sewing machine to create a single loose stitch and changing my settings to stitch length 5 and tension 3 so that it would be easier to gather. I simply hand gathered the front separate from the back based on my waist measurements and then secured it with a tight stitch before connecting the seams. I know having a gather foot would have made my life so much easier. The remaining fabric was used create to create a 2.5 inch waistband. 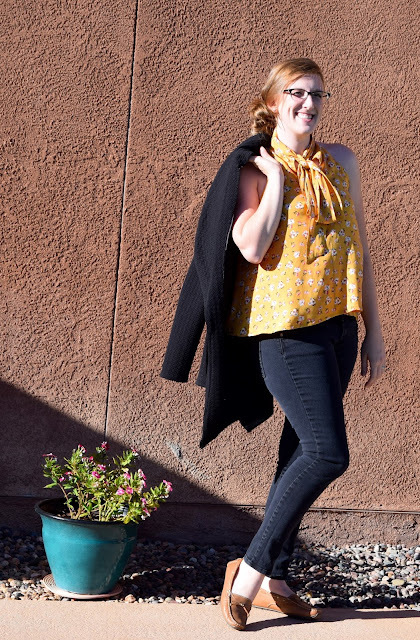 I opted to add an extra inch to my waist measurement as I knew that I will be wearing the skirt with a lightweight sweater or cardigan tucked in. After the skirt was gathered and the waistband was attached, I decided to shorten by cutting 2 inches off. I measures again from the waistband to ensure that the length matched all around. In am in love with modern day fashion using bold prints and colors with a touch of the 50s intertwined with a bit of 70s flair. 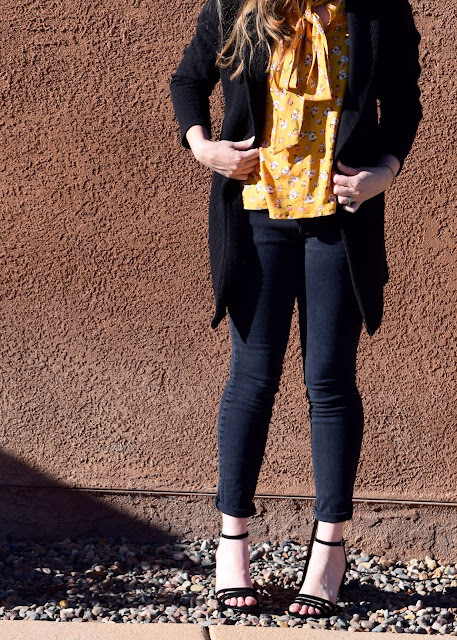 This look that I choose to create and style with my cardigan is oh so perfect for a board meeting and a night out salsa dancing after a wine tasting event. I truly enjoyed creating 2 pieces for this project that is a true reflection of my personal style. 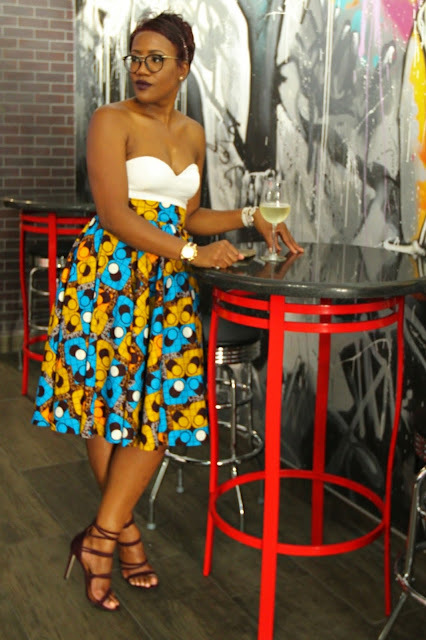 I had an amazing time capturing the beauty and flow of this look especially the skirt. I am in love with bold prints that make a statement the minute you walk through the door. The geometric shapes, the pattern details, the colors, the texture and flow is oh so perfect for the transition of my style from day to night. In closing I will continue to be bold, be fierce, but most importantly, be me! Hi friends! It’s Lindsay again. For this week's challenge we had to make two different articles of clothing. I interpreted the challenge to be more of a style challenge, challenging us to create two pieces that can be mixed and matched for day or night. Since fall is rolling in where I (usually) am, I wanted a cute sweater I could wear til winter. McCalls 7476 is going to be my go to sweater pattern. I love how easy this sweater came together and I have dreams of making it in a dark olive green. The length is perfect for my tall height and very on trend right now. I used a quilted black knit that is just beautiful for a sweater pattern like this. It was a bit tricky to sew without my serger but I zig-zag stitched every edge! 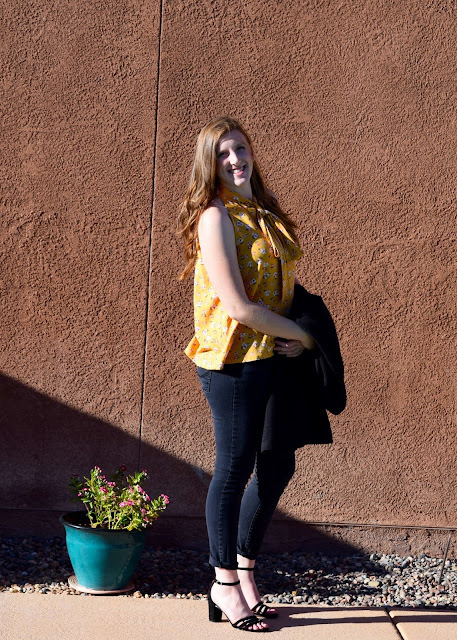 The shirt is fun and flirty for a night out, but pairs well with a sweater for work. 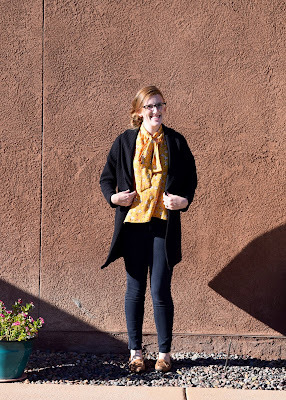 The mustard fabric is also perfect for fall! I like the bow tie on the front and have a few other shirts like this in my stash. McCalls 7601 came together fast and has options that include something longer or a high neck without the bow. For they day look, I paired these two me-made projects with my favorite black jeans. They are so comfy and are super skinny jeans I have had for a while. Throw on some comfy loafers and I’d be ready for a day at the office. For the night look, I was thinking realistically. I usually head out straight from work. So I rolled up the jeans and threw on some cute, but comfortable heels. I’m not really one for a wild and crazy night out or for wild and crazy heels. But I do love some chunky block heels that I can actually walk around downtown in. It gets really cold at night so the sweater can stay on or come off depending if we are headed somewhere outside. These two projects were sew fun and make me ready for fall. I am going to mix and match these pieces with my closet favs all season long. At the end of this month I'm going on vacation to Florida. I booked a flight on a budget airline and need to pack everything in a backpack that can fit under my seat. Thus, I need pieces that can transition easily from day to night so that I can pack lightly. For this week's challenge, I decided to make a matching crop top and high waisted pencil skirt. Paired with keds and my favorite Levi's denim jacket, you can easily achieve a casual daytime look. For night, ditch the jacket and put on your favorite heels for a fun and flirty night-on-the-town look. 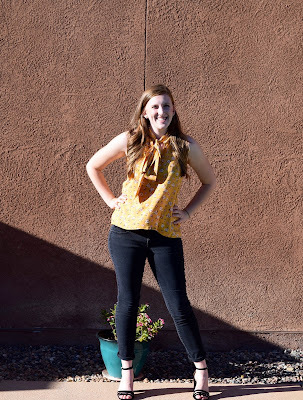 The top was made using Butterick 6175, which is an uncomplicated bodice pattern with sleeve and hem variations. I love this pattern because it's fast and easy. The pattern doesn't call for a lining, but because my outer fabric is see-through, I created a lining for my fabric. 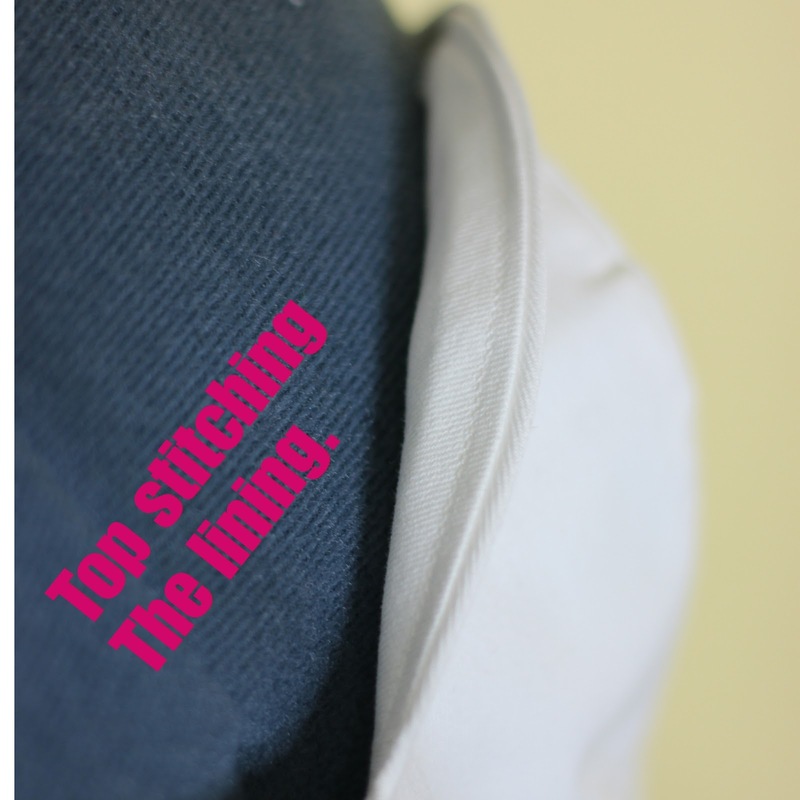 Instead of using facings for the neckline, I attached my lining to my neckline and under-stitched it. This is an easy way to create a nice neckline that stays put. I left my sleeves unlined. The skirt is from my favorite independent pattern maker, Named Patterns. This is Pulmu, a high waisted skirt pattern. It was my first time sewing up this skirt. What I've learned is that a fabric with more weight would have probably worked better. It was challenging to make a high waisted skirt with light fabrics. Live and learn. All in all, I think it still works. The other nice thing about making a matching set is that you get a lot of versatility. 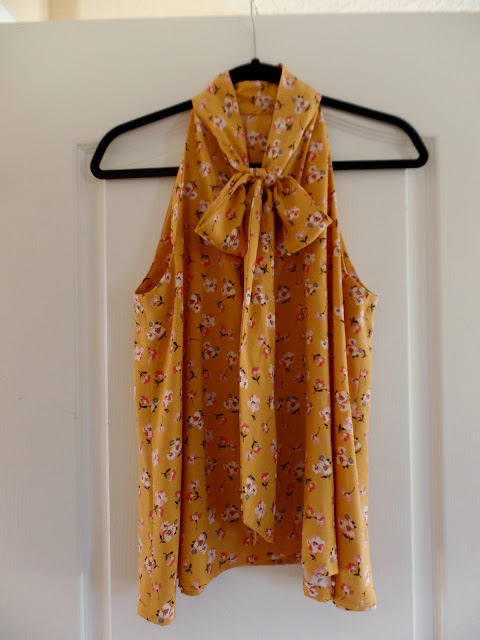 I could easily wear the top with a pair of high-waisted denim jeans for an easy-going day look. You could also tuck a slinky tank top into the skirt for a whole new look. 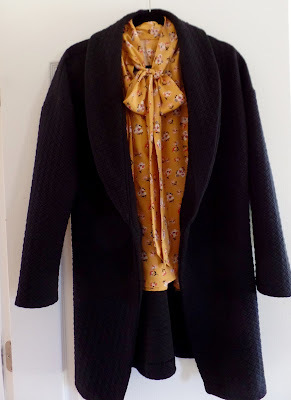 For my trip, I could pack this outfit, my jacket, a pair of jeans, and a couple of tops and have a completely versatile wardrobe that doesn't take up much room in my bag. Don't forget to get your Reader Participation entries in! They are due Friday, Sept 22 by 7:30am ET. Click HERE for details. i love seeing everyones projects every week. this so fun!!! I really love them all! I can't decide on which to vote on! What an awesome week! I love looking at the new looks that the ladies have created. I love all the entries! It's going to be so hard to vote this week.